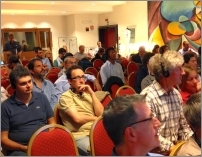 This conference in Rome covered most of the areas of Dr Reich's work. Presentations for three days came from the disciplines of physics, psychology, midwifery, social science, climate science, history, therapy, medicine, education and biology. A line of registrants wound up the stairs leading to the conference room located in the basement. Thirty minutes after the announced start time there was still a line winding out of sight up the stairs, and technicians were still connecting laptops to displays. Paying no attention to the line waiting outside, Roberto Maglione, speaking for the Italian Orgonomy Society, gave a welcome to those of us who were inside the conference room. 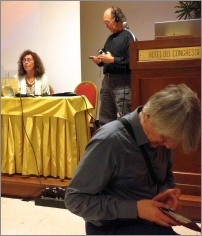 Simultaneous translation from Italian was provided via a wireless headset issued to all who wanted one. It is worth noting that the majority of the public in attendance was Italian, whereas nine of the eleven presenters spoke in English. There was a video welcome from Morton Herskowitz, DO. It was a bit of a ramble, as he is now in his middle 90's, but he did recall his first meeting with Dr. Reich. Herskowitz had planned on discussing psychiatric concepts and principles of therapeutic work with Reich, but had planned to stay away from any discussion of orgone. He was uncomfortable with the idea of this new idea, and indeed he confided that he wasn't even sure of its existence. However, Reich got right to the point very early on in the chat and asked Herskowitz what he thought of orgone. He replied that he felt uncomfortable with the concept. Reich replied: "Of course you are uncomfortable with it … but you will be able to see for yourself." Dr. Reich in a nutshell. Always the observer. Always ready to let the facts speak for themselves. For a good article authored by Dr. Herskowitz, go here. 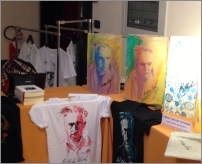 At first, it was a bit disconcerting to find t-shirts with Dr.Reich's image for sale in a vendor area at the rear of the conference room. I must admit that there is still a bit of a defensive reaction on my part when the topic of Reich comes up in conversation. In Europe his work has been more accepted and the slanderous defamation of his work has not received as much attention as it has in the USA. After all, the slander comes from the American press, so it is refreshing to see Reich accepted in a more natural and open fashion in Europe. Sure, t-shirts are a great sign of acceptance (not so sure about the lamps). The booksellers also opened a new vista to me. Unfortunately, most of the titles were in Italian, but Maglione's masterpiece is available in English. It is a jewel and I was very happy to discover it at the conference. For more on this book, see the writeup of Maglione's presentations. I will follow the order of the presentations as they were given. A complete list of biographies and abstracts of the presenters (in English) is here. One can always search this site for any concepts of interest by using the search box in the upper right. This is a search of just this site, and it gives best results if a single word or short phrase is entered.